A selection of our best "extra fancy" USA grown apples and oranges, bursting with sweet flavor and ready to take home in an easy to carry heavyweight box. 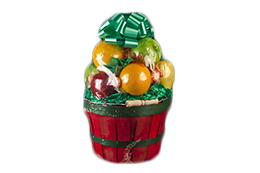 This 11 piece fruit basket includes 4 oranges, 3 granny smith apples, and 4 red delicious apples. Approximate weight: 5.25 pounds. Our finest "extra fancy" USA grown apples, pears, and oranges, perfectly ripened and artfully arranged in a natural weave tray. This 15 piece basket includes 3 pears, 4 oranges, 3 granny smith apples, and 5 red delicious apples. Approximate weight: 7.4 pounds. 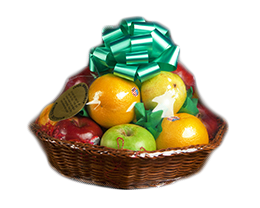 Our finest "extra fancy" USA grown apples, pears and oranges, perfectly ripened and tastefully gathered in a large keepsake woven basket. 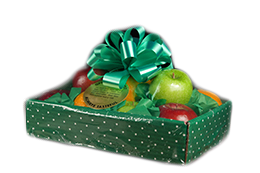 This 19 piece fruit basket includes 2 pears, 7 oranges, 4 granny smith apples, and 6 red delicious apples. Approximate weight: 9 pounds.